My trip to Bali started very early in the day. My flight was scheduled for 6:25 in the morning, which meant I had to be at the airport by 4:30 a.m. I had flown into Bangkok the day before and checked into my favorite hotel in Bangkok, the Floral Shire Resort. 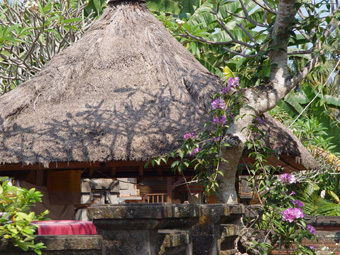 The rooms are great, the price is incredibly affordable, the staff very friendly and helpful. They offer free Wi-fi, and have a restaurant on the premises. 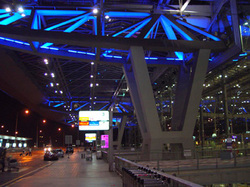 But the best service they offer is pick up and drop off at the airport at no additional charge. I received my wake up call at 3:30 in the morning, by 4:00 I was in their van on my way to the airport. Good thing too, because it did take a full 2 hours to get checked in and go through customs. By the time I made it to my gate they were calling for final boarding. 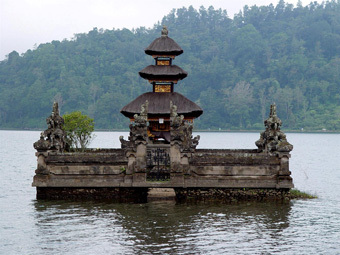 I had spent many hours researching Bali before my trip, trying to decide where I wanted to go and what I wanted to see while on this adventure. 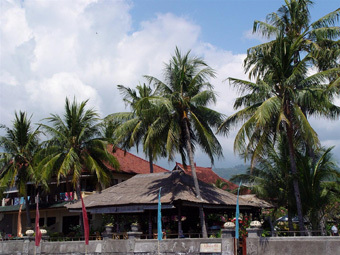 I decided to begin my stay in Lovina, a coastal town on the north eastern side of Bali. 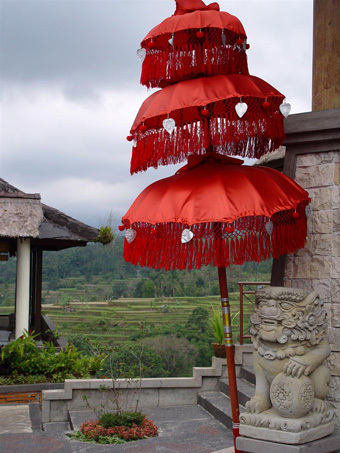 I had chosen a hotel that offered pick up, at an additional charge of course, but traveling alone I felt the extra cost was worth the reassurance that I would not get lost my first day in Bali. 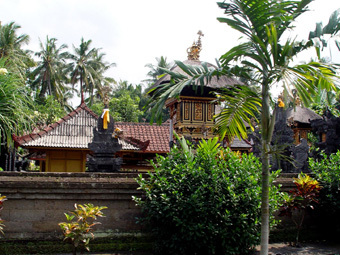 I was so thrilled when I had finally made it through customs, gathered my baggage, stepped out into the bright beautiful sunshine of Bali, and saw a friendly looking Bali gentleman standing there holding a placard with my name in big print! 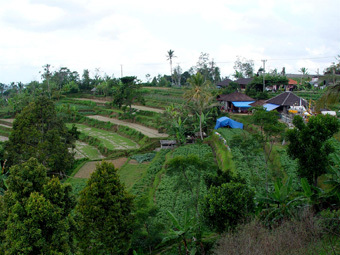 Our destination was 3 hours away, which was exactly what I wanted, a chance to drive through the countryside and see Bali. So far so good, I was very happy with the choices I had made so far on my trip. It was Saturday mid morning. The first thing I noticed while leaving the airport at Denpasar was all of the kites in the skies. Many different shapes and sizes and beautiful colors. 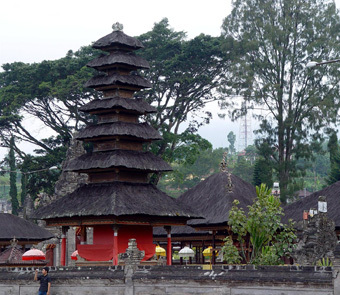 We drove through the city, and wound our way through small streets, winding our way across Bali through many little towns and villages. 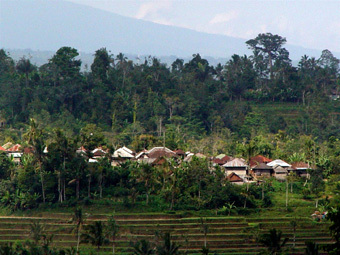 In between the populated areas were beautiful rice fields and jungles. 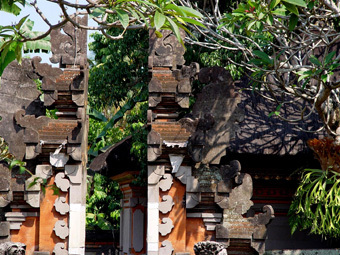 I was simply amazed with the beauty of the architecture of Bali. Everywhere you look your eyes are feasting on incredible beauty. The traffic is very similar to Thailand, the traffic flows on the left, with many motorbikes and bicycles sharing the two lane road. The pace was very slow and relaxed, not from congestion, but an unexplainable sense of respect and courtesy shared by all those traveling the road together. Which was great for me as it gave me a chance to really soak up the scenery. 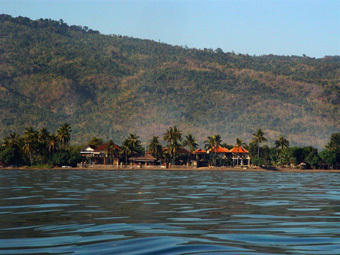 We made three stops on our way to Lovina. The first stop was for lunch at a restaurant that overlooked rice fields. The food was excellent, buffet style, very tasty, but quite expensive. The meal cost $10.00. Definitely the most expensive meal of my entire stay. 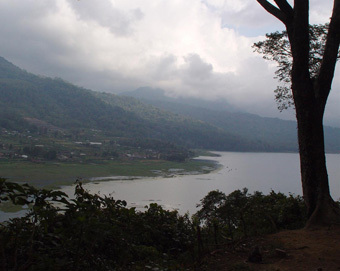 Our second stop was at a view point overlooking a lake. 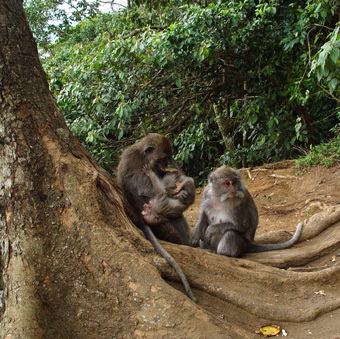 But it wasn’t the lake I wanted to see, it was all of the monkeys! The sides of the road were covered with monkeys. Vendors were selling bananas and peanuts to feed to the monkeys, which was a real delight for me! 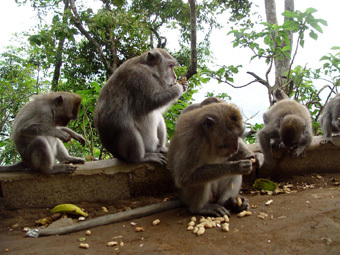 The monkeys were very friendly, and would take the offerings directly from your hand. If anyone knows me, you would know that this was extremely exciting for me! 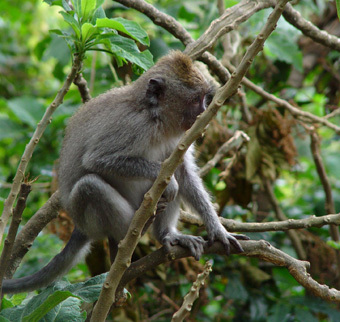 I reluctantly said goodbye to the monkeys, and climbed back into the car to continue on our journey to Lovina. We made one more stop along the way, at a Temple and garden area at another lake. When we finally arrived at our destination, the Adirama Beach Hotel, I was not disappointed with what I found. 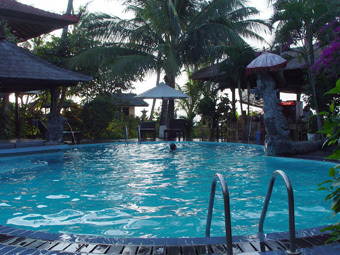 The hotel is beautiful, the room very clean and comfortable, a beautiful inviting swimming pool, and the beach is at the doorstep just beyond the bar and restaurant. The staff was extremely friendly, and very welcoming. There were two things I had planned for my stay in Lovina. One was a sunrise boat trip to watch the dolphins play, and the other was to go snorkeling in the beautiful waters of Bali. Seeing as I am vegetarian, travel is always a little iffy about being able to find food I will eat. I had printed a list from Happy Cow of vegetarian restaurants in Bali, just in case I needed it. I was extremely happy to discover the hotel restaurant offered a nice selection of vegetarian meals, and at extremely reasonable prices. Dinner runs about $2.40 – $3.00. Breakfast is included in the price of the room. When traveling on a shoestring budget like I do, it was nice to discover the food prices were so low. I found that to be true everywhere in Bali that I went. Vegetarian food was abundant, offered at nearly every restaurant I passed (always stopped and perused the menu’s posted outside, if not to drool over them, to get an idea of general prices and options). After enjoying a wonderful meal while overlooking the ocean at the hotel restaurant, I decided to call it a day and head to my room. 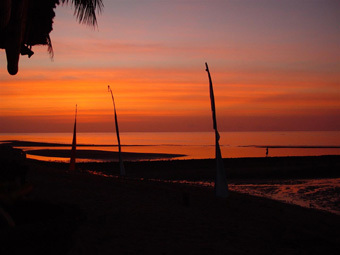 Before settling into my room and collapsing from the trip, I scheduled the sunrise boat trip for the following morning, figuring I was already on an early schedule, I would probably fall asleep easily and early that night, which would help me to get up at the crack of dawn. I even caught a beautiful sunset before ending my long day.